Hollington United Football Club’s first team moved level on points with the league leaders following their biggest win of the season. The Lions triumphed 7-0 at home to AFC Uckfield Town II yesterday (Saturday) to join Cuckfield Rangers on 40 points at the top of the Mid Sussex League Premier Division, albeit with an inferior goal difference and having played a game more. Hollington were asked before the game to be more ruthless, more clinical and to take more pride in keeping a clean sheet. Well they certainly listened as they put Uckfield to the sword with an exceptional performance. A free kick from Allan McMinigal and a header by Dominic Clarke put the Lions two-up at half time. For the second time in a fortnight against Hollington, Uckfield lost their discipline and again went down to 10 men. Rather than sitting back and seeing the game out, Hollington went for the jugular and Jan Bailey made it 3-0 with a volley from 12 yards. It was soon 4-0 when 16-year-old Finnley Page scored his first goal for the club with a superb finish from a tight angle. Clarke got his second with another trademark header from Andy Corrigan’s cross and then completed his hat-trick after great work from Jay Tomlin, who will question if his shot had crossed the line before Clarke smashed it home. The scoring was wrapped up when Tomlin got a deserved goal by finishing off a fine move with a terrific low shot into the corner of the net. Man of the match, sponsored by Jules Lovell sports massage therapist, was Tomlin. 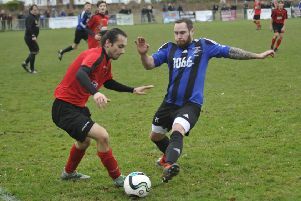 Hollington manager Scott Price said: “We were very impressive today from the first minute until the last. I’ve asked more of them (the players) today; I wanted them to be more ruthless and to take more pride in keeping clean sheets. Today they answered every question thrown at them, as a team and individually. “We started the season in three competitions, and we are now in the second week of February and still in the all three. “It was important for us to get our goal difference up as we are a long way off our rivals at the moment, which would be cruel if that’s what it came down too. Hollington are away to fifth-placed Forest Row, who play at the home of Southern Combination League club Oakwood, next Saturday. Mid Sussex League Premier Division top four (played-points): 1 Cuckfield Rangers 15-40 (+39 goal difference), 2 HOLLINGTON UNITED 16-40 (+27), 3 Balcombe 15-36 (+38), 4 Lindfield 16-33 (+35).